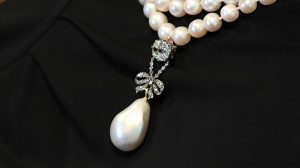 The magic of Queen Marie-Antoinette held say at Sotheby’s in Geneva when a pearl and diamond pendant that belonged to ill-fated French Queen was been sold for $36 million over an estimate of around $2 million. This is a world record for a pearl. The pendant was part of a collection of jewellery sold by Italy’s Bourbon-Parma house. Other lots included a natural pearl and diamond necklace, a pair of pearl and diamond earrings, and a monogram ring with a lock of her hair. The queen smuggled her jewellery to her family in Austria before an ill fated attempt to flee the French Revolution. She was guillotined aged 37 in 1793. The previous record for the most expensive pearl was a necklace once owned by Elizabeth Taylor which was sold for $11.8 million at Christie’s in 2011.